We’ve all seen it. Experienced it. Sometimes painfully – a complete display of obnoxious behavior by someone else’s kid. Maybe in a checkout line. Or the candy aisle. Or at a school event or party. For most of us, it takes a lot of willpower to not take over and manage the situation. Divvy out some discipline. Give that child a piece of your mind. Of course, you don’t. Because that would be inappropriate and awkward. There are boundaries to respect, after all. A child is clearly in danger – then, of course, jump in. A child is in your care – but ONLY with extreme care. The first scenario is obvious, but the second can get a little tricky. Let’s walk through a few ways you can put boundaries in place that make sense for you, your children, and the child who is in your care. Define the perimeters. Ask the child’s parent to share any house rules THEY have for their children, and then ask how they’d like you to handle discipline if those rules are broken. Gauge the parent’s temperament on how they handle discipline. 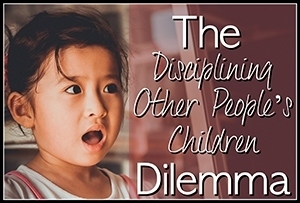 Naturally, if the other parent’s form of discipline is outside what you believe to be appropriate or respectful – keep to your Positive Parenting Solutions tools. Example – When guest children are not playing gently with the toys: First remind all the kids what “gentle playing” looks like, then explain that if they can’t be gentle, they’ll lose the privilege to play with that toy. Example – Hitting or fighting: After you calm the situation, brainstorm ways to peacefully resolve the problem. If the hitting or fighting continues, explain that the play date will then be over and they can try again another time. Gain agreement. Ask the children to repeat back the playdate rules and the consequences so everyone is on the same page. Stay calm and carry on. If things go south, respond calmly and focus on solutions to solve the problem. If you have to follow through with a previously revealed consequence, do so without frustration or lecturing. Communication is everything. If you do have to implement a consequence – share that with the other parent so she/he hears your version of the story. Lastly, remember that when we see a child having a meltdown in the aisle or misbehaving, there’s probably a backstory we don’t know. Maybe she’s overly tired or hungry or just having a bad day. Just like we’ve had our “less than glowing” moments as parents, our own kids have probably shown their less than angelic sides in public! Be kind in your comments about other children and encourage your kids to be as well. With your kids and others, keep the lines of communication open and set the boundaries that make sense for your family. When we lead by example, good things happen! Ready to learn more about the do’s and don’ts of discipline and all the tools you need to handle whatever parenting question comes your way?